Billing types are system configurable types which you can define and TimeLive allow System Administrator to create own billing types. TimeLive provides few pre-defined billing types which can be renamed or edited according to organization needs. There are two types of billing category which you can set up using billing type setup. Navigate to Admin Options and scroll to Billing Setup. Click on the button +Add Billing Type at the top-right of the screen. Enter the name of the Billing Type in the first field. Select billing category (select Employee if you are defining billing type of employee billing. Select Project/Client if you want to add billing type for the project). 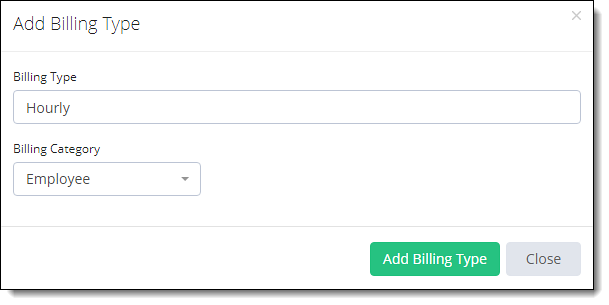 Click on Add Billing Type to add this to the system. In Billing type List, click on Options gear icon against the type which you want to edit and select Edit Billing Type. Update your required modification in Billing Type form. Click on Update Billing Type button to update this record. 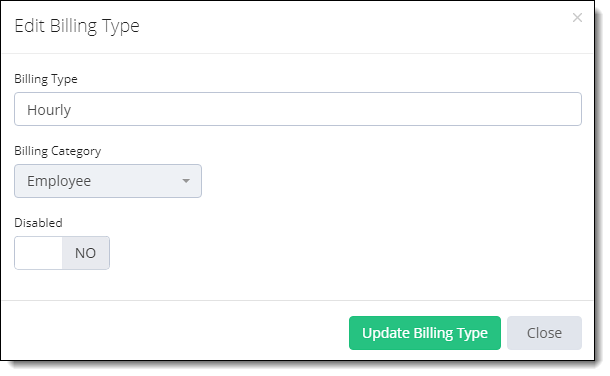 In Billing type List, click on Options gear icon against the type which you want to disable and select Edit Billing Type. Click on the Disabled switch and change it to Yes. In Billing type List, click on Options gear icon against the type which you want to delete. Click on OK to confirm deletion on the dialog box.